I hiked 52 days in 3 states and 2 countries, averaged 7.2 miles per hike, and hiked a total of 373.5 miles. 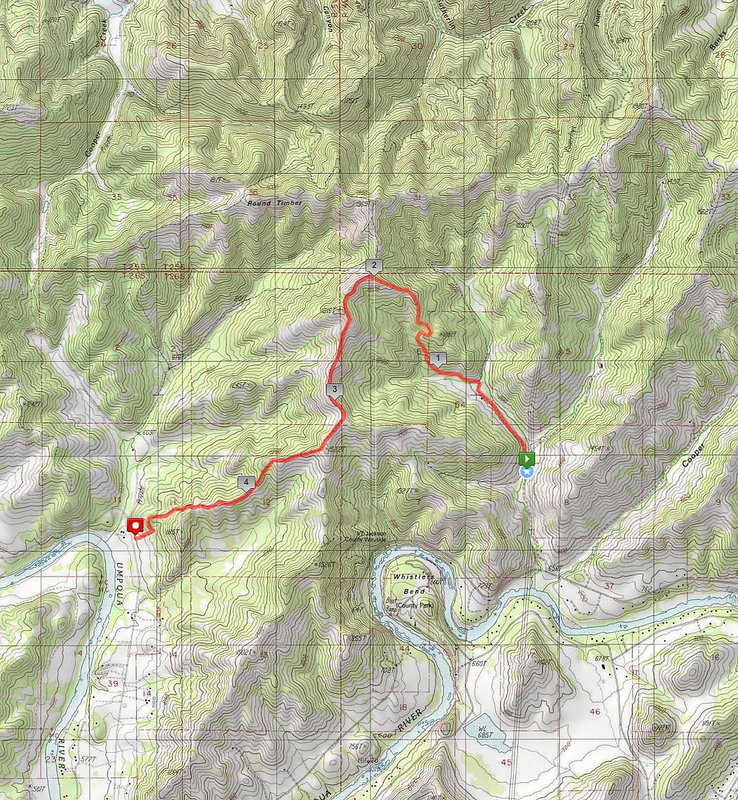 My shortest hike was 2 miles to Castle Rock and my longest was a 13.6 miler up to Mount Kit Carson (near Spokane, Washington) which also involved my scariest bear encounter ever. So, moving on to 2013, the Friends of the Umpqua Hiking Club hiked in the North Bank Deer Habitat in what is fast becoming our traditional New Year's Day event. Just as in years past, the hike began in bitterly cold fog, the kind of cold that slaps your cheeks like an outraged diva throwing a tantrum. Starting on the Soggy Bottom Road, the trail lived up to its name as some of us splashed our way through a soggy bottom while others waded through frosty grasses striving vainly to keep boots dry. Those of us in front briefly saw the distinctive white rump (stop with the jokes, already) of a Columbia white-tailed deer, the reason for the Habitat's existence. A left turn onto the North Gate Trail took us off Soggy Bottom and then the "fun" began. It is difficult to avoid hiking uphill when hiking in the Habitat and one of the steepest trails is the accursed North Gate Trail which so happened to be our route. The North Gate is cruel as the trail taunts hikers by forecasting the pain and misery yet to come as the route ahead is demoralizingly visible in all its burning leg pain glory. And just when you think it can't get any steeper, it does. I don't think the deer even hike up the North Gate. Blessings do get bestowed on hikers staggering up the North Gate in the form of magnificent views of the North Umpqua River valley. It was foggy in the valley but we were above all that so what we got to see were fingers of cloud cover with muntain tops poking through, all wonderfully illuminated by the winter sun. An unfortunate byproduct of my injured wrist is that I haven't been able to play racquetball for the last 4 months and an unfortunate byproduct of not playing racquetball is getting out of shape. So when we got to the Middle Ridge, most hikers in the group headed downhill while a few hardier members opted for the uphill and longer route to the North Boundary Ridge. I waited for my trembling legs to quit trembling but they didn't so, uncharacteristically, I opted for the shorter downhill hike. I felt so unworthy. The ignominy of passing up a Richard Hike opportunity was short lived as the views while we descended Middle Ridge were too sumptuous not to enjoy. The air was crisp and clean, a clear blue sky floated above, and we were hiking on windswept grassy hills above cloud cover. The winter air was crystal clear and we speculated what distant and large peak we could see on the horizon. I thought it was Mount McLaughlin but after consulting Google Earth, I now have to conclude that we were looking at Prescott Peak in California's Siskiyou Wilderness, a mere 100 miles away. As we lost elevation, we got closer and closer to the cloud cover, eventually entering the clouds, or fog as we like to call it. But, the fog was burning off, providing for a nice view of the North Umpqua River as we arrived at the trailhead. It was a nice way to start the new year, although we'll have to do something about that out-of-shape thing. For the rest of the pictures, please visit the North Bank album in Flickr.